Bellini Gentile is an Italian artist. Born presumably in 1429 in Venice, died in 1507 in Venice. The son of Jacopo Bellini and the supposedly older brother of Giovanni Bellini. Extremely revered artist during his lifetime. In 1479 he was sent to Constantinople to Sultan Mehmed II, who asked to send a good portrait painter. The artist was known for portraits of the Venetian Doges and full-size plot canvases. Most of the work died during a fire in the Doge's Palace in 1579. Italian painter. Master of the Venetian School. Son and student of Jacopo Bellini. Experienced by the influence of Mantegna. In 1469 he received a knighthood title from Emperor Frederick III. 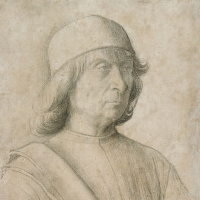 In 1474 he took the post of official painter of the Republic of Venice and was commissioned to lead work on an extensive cycle of monumental pictorial panels on historical themes in the hall of the Grand Council of the Doge’s Palace (not preserved). In 1479-1480 the artist visited Constantinople at the invitation of the Turkish Sultan Mehmet II, who also rewarded him with a knightly title. In the gentile Bellini’s picturesque heritage that has come down to our day, four songs are central to the genre of monumental multi-figure scenes on a historical theme characteristic of Venice. Three of them - the Procession on Piazza San Marco (1496), the Miracle with the cross at the San Lorenzo Bridge (1500), the Miraculous Healing of Pietro de Ludovici (1501, all - Venice, galleries of the Academy) - are included in the History of Relic series written by a group of Venetian masters for the religious-philanthropic fraternity of the Scuola Grande di San Giovanni Evangelista and dedicated to events related to the miraculous cross belonging to the fraternity; fourth - Sermon of sv. The stamp in Alexandria (1507, Milan, Brera Gallery), intended for the Scuola Grande di San Marco fraternity, is finished by Giovanni Bellini. In the works related to the late period of Gentile's work, the genre of monumental historical composition created by him appears in its classical form. The artist is likened to the author of the historical chronicle, depicting a legendary or real event with meticulously transmitted details of the situation, the appearance of buildings and squares, types and costumes, and many everyday details. And at the same time, the events depicted appear to Gentile Bellini as historically significant. His compositions are solemn, beautifully arranged, the abundance of figures and details does not create tightness in them; on the contrary, they have the stately breadth of space, clarity and severity of rhythm. Architecture plays a huge role in them - real or fictional buildings that create a majestic background of events that bring solemnity and strict orderliness to the compositions. The somewhat dryish pictorial style of Gentile is distinguished by the color and hardness of the pattern, the strict nobility of the colorful range, the abundance of light, and the transparency of the shadows. A number of excellent portrait images in these compositions testifies to the gift of portrait painter Gentile Bellini, which is confirmed by the few portrait works that have come down to us: Lorenzo Giustinian (1465, Venice, Academy Gallery), Sultan Mehmet II (c. 1480, London, Nat. Gallery) . Gentile Bellini created a whole direction in Venetian painting of the last decades of the XV - beginning of the XVI century, had a great influence on his contemporaries who worked in the genre of historical paintings, in particular, on his pupil Carpaccio.